Clathrin-mediated endocytosis is triggered by phosphatidylinositol-4,5-bisphosphate (PIP2) accumulation within the plasma membrane. PIP2 accumulates as a result of phosphoinositide catalysis by the lipid kinases, phosphatidylinositol-4-kinase (PI4K) and phosphatidylinositol-4-phosphate-5-kinase (PI4P5K) ,  and hydrolysis by phosphatases. The adaptor proteins (AP-2 in mammals or Sla1 in budding yeast) collapse on PIP2 in a stochastic manner and form an adaptor-PIP2 complex. 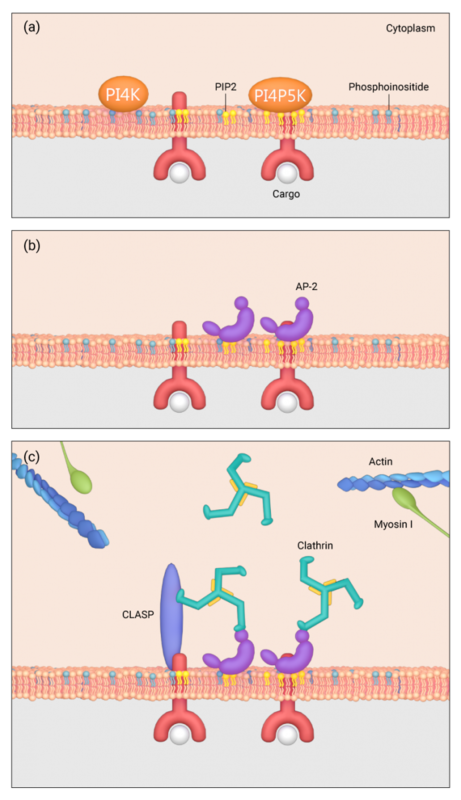 The complex is stabilized by accessory proteins, such as clathrin-associated sorting proteins (CLASPs) , actin and myosin I . AP-2 is autoinhibited in the cytosol when the levels of PIP2 or cargo are low. This prevents inappropriate clathrin recruitment. Binding of PIP2 and cargo to AP-2, which results from PIP2 accumulation, activates AP-2, allowing the complex to bind clathrin. The presence of cargo further stabilizes the nucleation process . The mechanism by which certain sites are chosen for endocytosis is not clear. In budding yeasts, large immobile assemblies of proteins on the plasma membrane called eisosomes have been identified. Eisosomes mark the sites of endocytosis, and are primarily comprised of two proteins, Pil1 and Lsp1.